Full Tilt Poker reopens – a day many poker players were unsure they’d ever see. The Ongame network is finally sold to Amaya Gaming from Canada for €15 million. Tom Brady wins the International Poker Open in Dublin for €42,530 against 1,147 entrants. German player Wojtek Barantny wins back-to-back UK & Ireland Poker Tour titles. Bwin.party co-chief executive Norbert Teufelberger is questioned then released by Belgian authorities over his company’s activity in the country. Online poker has grown 35 percent in Spain since regulation. PKR gets its five millionth user. James “Flushy” Dempsey becomes an Iveypoker.com pro. Switch Poker launches Bitcoin-only poker tables. 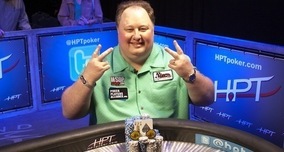 Greg Raymer wins a remarkable fourth victory in the Heartland Poker Tour. Dan “w00k13z” Cates wins the All-Star Showdown at PokerStars for $550,000. Bad news for Full Tilt’s former American players as the Poker Players’ Alliance says the return of $153 million is still a long way away. British cops fired for playing poker on duty. Swedish poker players are tackled by the tax man.